Vespertine: So I may have been a bit harsh in my podcast. To the point where I failed to realize we lost some good ring warriors that have been in XWA a long time and failed to pay my respects. Everyone has been honoring them in some way. And why not? 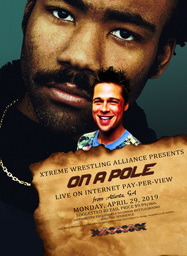 We lost Emery, we lost Aki, we lost Levinator, we lost Serena Maxwell, Winston Smith Jones, Dan Bennett and a few others but those that I mentioned are the ones that really defined XWA and put it on the map. They were the ones who defined a generation of wrestlers who came before us. For some of you, they were friends, for some of you they were enemies. They were rivals, they were opponents. But for all of us, they were the best at what they did and they held XWA together. So in a sense, they were the glue and the bonds. So dearly beloved today we gather here to mourn the loss of innocent and not so innocent lives, mainly the careers of the aforementioned people. There will always be a place in the heart of every man and woman, every fan, every staff member that has graced the hallowed halls of XWA. At one time or another you either ran across, bumped into, befriended or feuded with Emery, Levinator, Smith, and Dan. And in AJ's case, proposed to Emery. She is a good catch. He is a good catch. Together they are a great match. But one is dead and moving on and the other still lives and walks the halls of XWA. There is not much I can say about Emery, Winston, Dan, Serena, Aki, or Levi. They defined themselves. They defined a generation. They were the trailblazers who came before us and the ancestors we look upon to guide us. And they are dead now so we honor their memory. While their spirits and enthusiasm are not lost in the annals of time and the histories of XWA, their bodies, their careers, their passion for the game we call wrestling lie here now. They will rise and wrestle no more, they have breathed their last breathe, they have played their last game, won or lost their last match. What could he said about ring warriors like these? [/colorThey are what's right with the business today. They are what makes this place tick. They are the hard working soldiers that forged ahead, created alliances, blazed their own trails, held their own even when everyone said they shouldn't because they weren't enough something. What's wrong with the business is those who said they couldn't shouldn't and wouldn't succeed. What's right is their belief's. What's right is what they fought for. What's right is how far they were willing to go to show that they could, would and did succeed. What's wrong with this business are these new wrestlers who look down upon their business ethic, who think that they are entitled and then whine and complain when they aren't given a title belt. Did they happen to earn a shot at the title belt. Yes, but they lost and then they complain about the system being stacked against them. They are what's wrong with this business. Dan, Emery, Smith, Aki, Levi, they were the opposite. They were what's right for this business. They are the ones you look up to, the ones who forged trails while you sat back and complained. And when they lost, they didn't complain, they hurt, they cried, they felt pain and loss, but they came back for more. They came back bigger, better, stronger. And in everything they did, their actions, their words, their story was told in ring in front of millions of people who either loved them or hated them. Cheered them or jeered them. Who in this business can say they can do that today? And while I may have put them down for leaving when they did under the conditions that they did, I will never question their hard work, their work ethic, how far they were willing to go or how well they competed in the ring. They...were....Warriors! They were wrestlers. They were competitors. First: "Emery Layton, began 2016, died: 2018. "This little red ball of rage finally fizzled out at last." Second: "Aki Yasuko. Began ?? ?, died: 2018. "Kagome's pet fought and lost and does not lie peaecfully here". Third: "Dan Bennett: began ?? ?, died 2018." Fifth: "Levinator, began ?? ?, died 2018 "What can be said about him." Sixth: "Serena Maxwell, began ??? died: 2018. "Can someone finally explain her?"..." Dearly beloved, they were what was right with XWA. But now they are gone forever. They are being replaced by a new generation. By me, by Albion Gale, by Jace Albright, by Ethan Cross, Kaida Kagome, Angelica Vaughn, Sarah Lacklan, and Alex Kincaid. We are here to replace those we have lost. We are here to take over the federation they held so dear, so long ago. They have been replaced and they will never return. In their place, I hold the banner of XWA up high. In their place, Sarah and Angelica hold their XWA titles up high. In their place Ethan and Jace will hopefully do us proud (she shrugs) and carry whatever weight was heaped upon their shoulders. In their place, Kaida will make heads roll. Anyway, this isn't good riddance but on the other hand, it is very good riddance because now that they are gone, WE can rise. We can rule. We can dominate. As only I can do, as only Sarah can do, as only Kaida can do, as only Cross can attempt. They fought hard, fought right, fought the good fight, found friends, made enemies, garnered respect and did what only a few can dream of doing. But now, now it is our time. It is the time of the next Generation. And while we don't exactly see eye to eye to eye between us. Some of us are more enemies than friends, more rivals than enemies, more strangers than acquaintances, let's make one thing clear: we are here, we will not fail you. We will not fail ourselves. We will not let the fans (or those who follow us) down. But make no mistake, we all have one goal in common: to get to the top of XWA. And I will do it by any...means...necessary. Life goes on. In 10 years nobody will care. In 5 I will be on top. And XWA soldier's on. Right now though, may they all (spreads her hands out as if to encompass all the gravestones): Rest....In... Peace!